Recommended since 1994, we carry a full line of Howard Products: 'Restor-a-Finish', 'Feed-n-Wax', Orange Oil, Paste Wax, Silver and Brass polish, Granite & Marble Cleaner, and a Stainless Steel Cleaner. 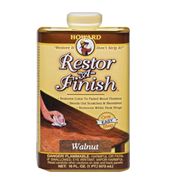 To enhance the look of our fine furniture we use Howard 'Restor-a-Finish', followed-up with Howard 'Feed-n-Wax'! Restore-It - Don't Strip It! With a simple wipe-on, wipe-off process, most finished wood surfaces that seem to need a refinishing job can be completely restored in a few minutes. White heat rings and water marks, sun fade, oxidation, smoke damage, and most other blemishes can be quickly eliminated. Before you go to the extreme of stripping it, try restoring it!Restor-A-Finish is available in nine colors: Neutral, Maple-Pine, Golden Oak, Cherry, Walnut, Mahogany, Dark Walnut, Dark Oak, and Ebony Brown. Prevent Drying & Cracking! 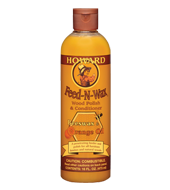 Howard Feed-N-Wax prevents drying and cracking while preserving the wood finish. Feed-N-Wax is a special blend of beeswax, carnauba wax, and orange oil. It enhances the natural beauty and depth of grain in finished and unfinished wood, especially oak.